For decades, Ntozake Shange's play -- "For Colored Girls Who Have Considered Suicide When the Rainbow is Enuf" -- has been the Aha! and the Amen! for Black women. Now Tyler Perry's Hollywood adaptation introduces the work to a new generation. In defiance of his critics, the media mogul is determined to turn Shange's choreopoem into Oscar gold. 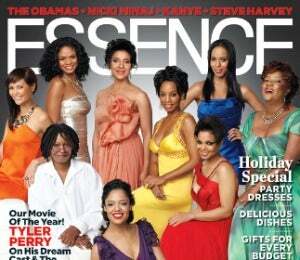 Take a look at the two covers for the December issue of ESSENCE -- one featuring the female ensemble of "For Colored Girls," and the second featuring Tyler Perry and the men... Here's what you had to say: Kamica commented via Facebook: "I am loving this ESSENCE cover. The women look beautiful. Black is beautiful!" Tracye wrote via Facebook: "I can't wait to receive mine!" “…I want this film to awaken people to the power of Black actresses. I want people to know there are things that Black women go through that aren’t slavery or hip-hop. I want people to know Black women as Americans…” –Anika Noni RoseFor decades, Ntozake Shange’s play — “For Colored Girls Who Have Considered Suicide When the Rainbow is Enuf” — has been the Aha! and the Amen! for Black women. Now Tyler Perry’s Hollywood adaptation introduces the work to a new generation. In defiance of his critics, the media mogul is determined to turn Shange’s choreopoem into Oscar gold.